As I've hinted, behind the colds, curries, and coconut custards, I am working on another book! This one is a collection of thirty embroidery projects that incorporate cross-stitch, crewel, and regular floss embroidery. It will be published, again by Potter Craft, in the spring or summer of 2010. I have never worked as happily on anything as I am on this book. Everything — manuscript,illustrations, charts, and photos — is due on my editor's desk on April 15th. I started developing the projects earlier this fall, and every day of creating them has been so satisfying and enjoyable. I honestly think I will be sad to be finished with this one, which (for lots of reasons) I couldn't have said about Stitched in Time. For one thing, I have had a lot more time to work on this new book (as of yet untitled), compared with the wild-eyed and desperate dash-to-the-finish-line that was Stitched in Time, and that has made so much difference. Last spring, soon after Stitched in Time was totally out of my hands and off to the printer, I started thinking about what I wanted to work on next. An article I'd written for Hallmark magazine had come out just a couple of months before; in it I told the story of my accident and talked about how important embroidery was to my recovery during that bewildering, terrible time. 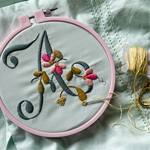 I hadn't really thought about embroidery, let alone done any really big embroidery projects, in a long time, but writing about it reminded me of how intensely connected I feel to this amazing medium. After the article came out, I received so many letters and emails from people who told me of their equally therapuetic experiences doing embroidery, and other kinds of detail-oriented, contemplative handwork. The letters really moved me. When my editor called and asked me what I was thinking about, I knew exactly what I wanted to do. This book is a collection of my dream projects, really. I've interpreted so many of the things I love here — intricate cross-stitch motifs, vintage monograms, tolework borders, folky hearts and flowers, naturalistic botanicals, delicate alphabets. Some of the designs are old, treated in new ways. Some of the designs are new, incorporating traditional techniques and stitches. All of them, first and foremost,are things I just love. I'm so grateful to be able to contribute something to this medium that has given me so much. I cant wait to see the book either! Stitched in Time was so beautiful, I've really enjoyed it. You do awesome work! I am so excited. Excited for you that you are doing something that is bringing you such happiness and excited for us that we have more of your beautiful designs to look forward to. So tell me...how are we all supposed to wait til NEXT YEAR?!?!? Oh boy, we have something wonderful to look forward to! As a teenager I did a lot of embroidery, pillowcases and such for my "hope chest". I still have some of those things and love using them. 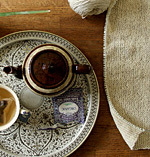 Your projects are so beautiful, they make me want to take up my needle again! Yippee!! A new book! And if that picture is an indication of what's to come, I'll be in heaven. Beautiful!! Exciting! Your work is so beautiful, and I'm sure the new book will be, too. I'm not a fabric crafter (I have convinced myself that I am incapable of sewing), but for some reason, I think I could probably do embroidery. It seems like a pleasant way to spend an evening. This is such a great article. Thank you Alicia! Also: hurray for a new book! I am a rudimentary embroiderer, but I am very excited to learn more! Now, not only can I do that, but you can be a teacher! Yay! I can't wait to see it! I don't really know how to embroider very well but am desperate to learn. Now I'll have to just so I can make your projects! How fantastic! I am really enjoying "Stitched in Time" so I will love this next book even more! All the best with your work. Thank you for all that you give of yourself. Beautiful. I'll look forward to the new book! When can I reserve a copy?! Isn't it wonderful, after such a terrible accident, to find some purpose to it...? I knew Andy was a great person for other reasons (geologist degree almost in hand myself). I'm excited to see the new book. It will seem like forever until it arrives on shelves. Congratulations!! That sounds like a great idea for a book! Oh wow. I cannot wait. Absolutely beautiful Alicia! Oh, oh, oh! I am *peeing* myself with excitement about this book!! 2010?! Soooooo far away... sigh. Sounds wonderful! I can't wait to see it! I must check out your other book as well! It's so true about the healing qualities of embroidery. I found out last week at 23 weeks pregnant that my baby has a heart defect and will require heart surgery as soon as he is born. After an agonizing week of shock and sadness and many sleepless nights I set about designing him a blanket to take to the children's hospital with him after he's born. I'm embroidering a heart stitched back together, because in my head - this is all I can do to help him heal. Embroidering the heart for this blanket will be my way of healing and coping with this life altering news. I'm sure embroidery has helped many other women get though difficult times just by the sheer meditative quality to it. A is also for Amazing, which is how I would describe your needlework. I dabbled a bit as a kid and have wanted to learn for real this time, but have yet to find the right book or class to ease me into it. Having read your blog for years, I know you will give me the confidence I need to actually jump into a project. Add me to the list of those preordering as soon as we're able. This also seems like my dream book. And my name is Amy so I must stitch a floral A. This is beautiful! I absolutely cannot wait for the new book!